1930s America. 15 year old Thea Atwell is ‘sent away’ from her home in Florida to The Yonahlossee Riding Camp for Girls, hidden in the North Carolina mountains. Her father drives her, though it is a long journey, as ‘[her] parents did not trust [her] enough to let [her] ride the train alone.’ We soon learn that the Atwells are well off and live on an estate in Florida, growing oranges. Thea’s father is a doctor, and travels around their rural community to see his patients; their mother keeps house; and Thea and her twin brother Sam are free to roam around ‘out back’, Thea riding her beloved pony Sasi every day. Thea’s love for horses is intense and deep-set within her. If she doesn’t ride for more than a day or two, she feels an ache to be back on a horse. She acknowledges that she is a reckless rider, always pushing herself and the horse to the limit, wanting more and more. Wanting seems to be Thea’s problem. I will not give anything away about the plot developments, but Thea always seems to want more than she is supposed to have. Looking back at the book as a whole, I can see that Thea is a product of her environment. Her Florida home is secluded and she sees barely anyone outside of her family. When she arrives at Yonahlossee, she is shocked by the amount of girls there, and finds it hard to interact with so many new people, used as she is to a life with her parents and Sam, with only occasional visits from Uncle George, Aunt Carrie, and cousin Georgie. Her life has been filled with limits, and she wants to break out of them, both at home and at Yonahlossee. 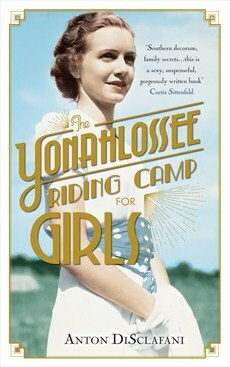 By 100 pages into The Yonahlossee Riding Camp for Girls, you are truly immersed in Thea’s story. Her first person narration is careful, intense, measured, and has a great emotional subtlety. The pace of the story is quite slow at times, but not so much that it drags. That said there are certain moments where you wish it would hurry up because you are dying to know what happens! There are two timelines within the novel – Thea’s time at Yonahlossee, and a series of flashbacks to the events that led to her family sending her away. From quite early on we know that Thea did something bad, that she is being sent away as some sort of punishment or at least ‘training’ to become a well behaved young lady. She doesn’t really want to be at Yonahlossee and finds the whole place, and the people, strange and hard to understand. She latches on to one girl, Sissy, and they remain best friends through the ups and downs of their time together. Everyone else Thea is slightly ambivalent towards, sometimes liking them and sometimes not. Her relationships with the girls in a wider sense reminded me of my all girls school: you know who everyone is, and you know something about them, but you aren’t necessarily friends. Everyone is very familiar, and there is some unspoken, unrealised connection between you. You see these girls every day, and though you aren’t close they are somehow an integral part of your life. Everyone’s actions affect everyone else. When I heard about this book, I wasn’t sure what it would be; but now I’ve finished it I know that it was not what I expected. It is a coming of age tale, a family saga, a love song to horses, and to the naivety and innocence of youth, but it is also a drama – a story of forbidden love and lust, about making difficult decisions. There is great sadness in this novel, and in Thea, but great strength too. I admired her determination to succeed, to win, to get what she wanted whether it was a good idea or not. I was surprised by the intense and graphic (and often quite emotional) sexuality in this novel, and by Thea’s appearance of maturity. Underneath she is just a girl of 15 and 16. She does not know any better. I expected to like The Yonahlossee Riding Camp for Girls, but I actually love it. Thea is a brilliantly realised character, with excellent development over the course of the novel, and her relationships with the other characters are beautifully drawn and examined, as well as being extremely believable; though I was a little shocked at her brazenness at certain points, with a certain someone (which I can’t detail without spoiling the plot), and questioned the believability of such a relationship. It was certainly unexpected. Meanwhile the 1929 economic crash looms in the background, creating a sense of desperation as families lose their houses, girls have to leave Yonahlossee because their families can no longer pay, or they have to stay there for Thanksgiving and Christmas because they can’t afford the journeys to and from home. Everything seems to be on a knife edge, intense and uncertain. Anton DiSclafani is a wonderful writer, and she has a clear love of horses, as well as deeply felt understanding of what it is like to be a teenage girl with so many emotions and hormones, and so many expectations to live up to. Yonahlossee is a heartfelt novel with great depth, and great intelligence. There are moments of real beauty and poignancy, and you are taken with Thea on every step of her emotional and literal journey. It is not an overly sentimental book however. There is plenty of action and drama, as well as carefully drawn moments of lust, love, and fear. Thea is a character I wished I could stay with beyond the end of the novel, and DiSclafani is a writer I will certainly read more of. As with Thea, The Yonahlossee Riding Camp for Girls will stay with you long after you have left it. Published tomorrow (6th June 2013) by Tinder Press, an imprint of Headline. My copy was kindly provided by the publisher for review. Great review- I have wanted to read this for a while now! !